Presented here is the start to this "complete" information on the Border Kingdoms (as complete as anything can ever claim to be! ), updating - and at long last concluding - details originally appearing in Polyhedron's Elminster's Everwinking Eye column. "The Border Kingdoms? Overgrown villages where rogues and adventurers brawl and posture, lad - in short, a place like most grand realms in this world!" "My favorite Borderer is the one on the end of my sword." "I toured the Border Kingdoms once. Dreary backwaters, my dear, all mud and rough unkempt types who wanted my money. I had to kill forty-two of them, and broke my best dagger in the eyesocket of the most inconsiderately belligerent. Uncivilized louts - completely uncivilized!" "The Border Kingdoms are the best place to fast make one's fortune - or find one's grave. Send all your malcontents there... and chivvy all your bored nobles after them, to watch the fun." 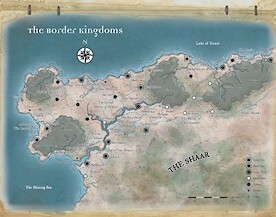 The Border Kingdoms are little more than names on a map to most folk in the Heartlands of Faerûn. Only a few sages and well-traveled merchants know anything useful about them, thanks to their ever-changing nature, and travel there being hampered by incessant Borderer wars with each other and land-hungry satraps of Calimshan. According to the sage Meriadas of Westgate: "The Border Kingdoms are the most favored destination for adventurers who want to proudly and boldly conquer a realm or establish their own new kingdom. Lords, counts, dukes, kings and emperors rise, proclaim themselves, and are swept away with the speed and regularity of waves crashing upon a shore. What comes to our ears... are a stream of amusing or colorful little tales of their most daring, disastrous, or funny deeds. "Few folk go there except those who want to carve out a place for themselves with a sword... Borders and even the names of the realms they define change with each passing month and even tenday; there is no such thing as an accurate history or even map of the Border Kingdoms (which are named thus) because they stand in the way of Calishite expansion, their turmoil and stubborn strength defining the eastern border of that proud realm... south of the Lake of Steam... the Border Kingdoms spread east and south to take in all the lands drained by the River Scelptar as far as the Shieldmaidens (the hills at the western end of the Firesteap Mountains, just east of The Duskwood) and the rising land that defines the northern edge of the vast rolling grasslands known as The Shaar." If you would travel there, Meriadas adds: "Take strong spells, trusty friends, and sharp swords, and you may live long enough to have a brief look around." The infamous mage Elminster warns that the Border Kingdoms are "riddled with wild magic, as a tattered cloak covers much but not all of the beggar beneath it." The Border Kingdoms are a triangular strip of warm, lush coastal downlands between the grassy uplands of the Shaar and the Lake of Steam. Four major forests divide up the Border countryside of rolling, fertile, overgrown hills. Though smokeholes and volcanoes are common around the rest of the Lake of Steam, the only known volcanic activity in the Borders is centered on a wood-cloaked ridge known as the Mount, where sulfurous fume-holes vent steaming vapor that from time to time causes trees to catch fire and burn to the ground, while leaving neighboring trees untouched (hence the old term "the Flaming Wood"). Many volcanic-warmed caves and crevices on the Mount shelter brigands and monsters to this day. The Border Kingdoms aren't all "kingdoms." They are many small principalities governed in a wide variety of ways, a confusing, ever-changing hodgepodge of tiny, unstable realms with names whose grandeur often outstrips reality. This verdant, chaotically-governed region is prime adventuring territory. Many adventuring bands come to the Borders to conquer their own realm - yet those who succeed often spend the rest of their days defending it from other adventuring bands with similar ambitions. The Borders are the birthplace of many a mercenary and merchant who hails from "a place you've never heard of." In the entries that follow, those for countries end with a list of settlements. "None" doesn't mean that a land is uninhabited, just that it has no named surface settlements known to outsiders. It should always be remembered that borders and rulers can and do change with bewildering rapidity in the Border Kingdoms, and the lore given here may contradict earlier lore - and may itself be outdated by the time you read this. It's been said there are no accurate maps of the Border Kingdoms, where boundaries, rulers, and names of realms change from tenday to tenday, and border disputes seem to occupy the lives of many on a more-or-less daily basis. Maps will be sadly out of date at best, and full of willful distortions at the worst (many cartographers seek to suggest the realm they represent - or want their local ruler to trade with - is larger and more important than it really is). Misinformation is the rule when Borderers travel the Realms in search of adventurers to hire. So beware: on any map of the Border Kingdoms, boundaries are at best approximate, and between the making of the map and your journey, realms will probably have appeared, disappeared, or moved. The land of Thuntar, for example, is named for the self-styled "King of Adventurers," a huge man from the Tashalar who hoped to find quiet retirement in the Border Kingdoms but found himself continually hounded by the one thing he couldn't fight: magic. Accordingly, the land known as Thuntar has moved thrice. Once it was roughly where most maps place Talduth Vale now. Later it occupied the coastal uplands of Ondeeme (before the mage of that name transformed or drove out all inhabitants to found his own realm there), before finding its present locale on the western shore of the Borders - where it was once in the uplands, but lost territory to marauding giants (land later seized by adventurers who slaughtered the giants and founded the land of High Emmerock). Migration and skirmishing are constant in the lives of most Borderers. The warm climate and fertile ground make it possible for inhabitants to do battle whenever they desire and still have food enough to see them through the winter ahead, and to live in caves or shelters in the deep woods and not freeze in the "cold months" (which are actually foggy, slushy months far warmer than the howling, deadly "winters" of more northerly regions). The adventurer Steeleye once called the Border Kingdoms "a deadly but enchanting place where every winding lane takes you to another dotty little realm, complete with pompous rulers and customs, grinning and well-paid mercenaries - dubbed the "Grand Guards"or the "Imperial High Host" - who tolerate these ruling dolts until the coins run out, and crumbling castles here, there and everywhere... monsters roam, crops fall off their vines in such plenty that the feast-tables groan, and magic goes wild, opening gates to perilous realms or inverting keeps as often as it does whatever was intended. It's hard to ride half a day in the Border Kingdoms without befriending or offending a Lord High Protector, a Grand Savant, or a High Puissant Duke - or all three." The Border Kingdoms are often raided by nomads from the Shaar (seeking food, weapons, and whatever else they can carry off). Their raids on caravans have given The Realm of the Ready Sword its name, and forced the creation of alert and capable military forces in all of the Border realms south of the River Scelptar. Borderers spend much of the rest of their time fighting each other or privately-sponsored Calishite armies. This makes many Borderers reluctant to leave their lands (or at least the region); consequently, most merchants traveling through the Border Kingdoms are enterprising folk from the Vilhon Reach. They trade both coins and trade goods (such as fine clothing or bolts of cloth and all manner of smithywork) for the ever-abundant food. Borderers tend to build stout and well-guarded granaries, gather in food to these compounds, and wait for merchants to show up, buy it, and carry it away. Many folk in the overpopulated Vilhon Reach lands would starve if Border Kingdoms crops ever failed or were mostly destroyed. Ed Greenwood is the man who unleashed the Forgotten Realms on an unsuspecting world. He works in libraries, writes fantasy, science fiction, horror, mystery, and even romance stories (sometimes all in the same novel), but he is still happiest churning out Realmslore, Realmslore, and more Realmslore. There are still a few rooms in his house with space left to pile up papers in . . .